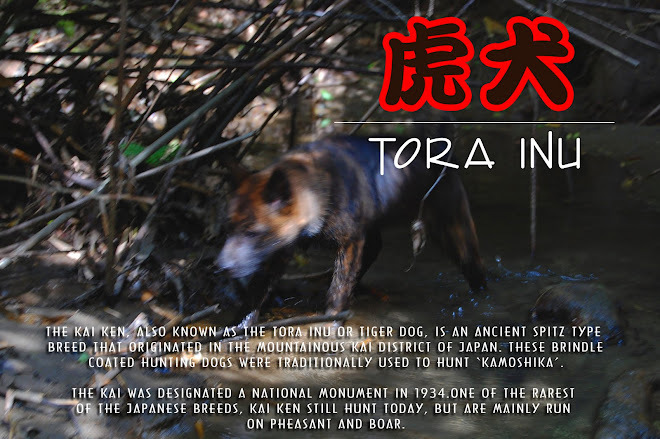 In Japanese, a matagi (又鬼・マタギ) is a group hunter using an old method in the Tōhoku Region and Hokkaidō. The matagi of Aomori Prefecture and Akita Prefecture are famous. Matagi are different from hunters with modern equipment. Forests have diminished, and hunting Japanese serow (氈鹿、羚羊・カモシカ) is now forbidden in Japan. There are various opinions on the origin of the word matagi. The leading opinion is that the word developed from matangi matangitono (マタンギ・マタンギトノ), which means "the man of winter" or hunter in the Ainu language. There is also an opinion that a word matagi previously existed in the Japanese language, and that the Ainu language borrowed it. The matagi would grow crops and build small cabins in the mountains during the summer to prepare for the winter hunt. 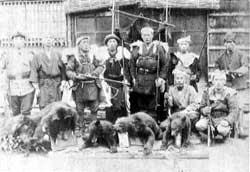 Every year they would make small hunting parties and head into the mountains to hunt big game, mostly bear and kamoshika (a type of mountain antelope). The matagi's weapons were long spears and poison darts, though later they began to use firearms. The matagi had their own language they would speak while hunting, as speaking everyday Japanese in the mountains was forbidden, and the entire hunt itself was steeped in tradition and religious rites. Alcohol, singing, whistling, yawning, spitting and all unnecessary noise were forbidden. The matagi had a strong belief in the gods of the mountain. They believed the mountains belonged to the gods, and the bear was a gift to them. They conducted purification rituals before the hunt, and had prayers they would recite after a successful hunt. The spread of modern civilization and the use of firearms forever changed the lifestyle of the mountain villagers. The matagi died out and faded into legend. The story of the matagi is one of man living in harmony with the mountains, taking only what he needed, surviving in the face of danger and hardship off of the gifts he received from the mountain gods.